You know those ideas that you wish you had? My Friendship Bracelet Maker is one of those. If you've ever knotted a friendship bracelet, you remember trying to keep strands separate while you were knotting, putting a safety pin in the knee of your jeans, or using duct tape to tape the top to a table while you were working. I used to make friendship bracelets for extra money and did all those things. It really does travel well, and you or your favorite tween or teen can use it on a lap, it can be set down when you need to take a break without having to fuss with the threads. I made a couple floss type bracelets, but then decided to try it with my favorite hemp knotting technique. It worked like a dream. Cut two strands of hemp, one 20 inches, and one 2 yards. Fold both strands in half and tie an overhand knot a half inch from the fold. 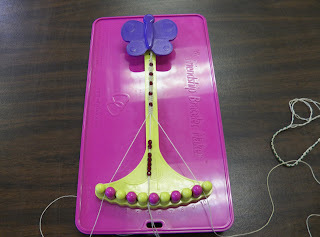 Then string the beads on the two short strands. Those will be your core strands. If you're using the Friendship Bracelet maker, you clamp the loop under the butterfly, then the two core strands wrap around the center peg at the bottom. Then you'll start tying the knots. I decided for mine to tie 7 knots between each bead. The knots are worked around the center cord like this. Tie 6 knots which will create 3 "bumps" on each side, slide a bead up the core thread, bring the two working threads around the bead, and tie 7 more knots. Continue until it's long enough to tie around your wrist, ending with a knot section. Knot one working thread and one core thread together, and do the same for the other two threads. Trim evenly. When you're ready to tie it on to a wrist, thread one set of threads through the top loop, and tie in a square knot. Making these using the Friendship Bracelet Maker works quickly compared to traditional methods because it's so easy to keep all the threads in right alignment, and I found the same was true for regular floss type bracelets. 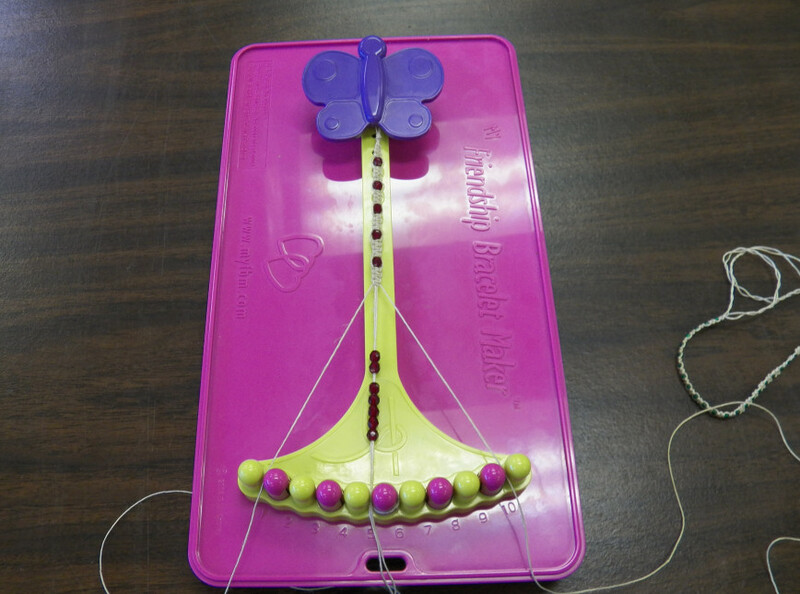 The My Friendship Bracelet Maker also has a case built in to hold your floss. 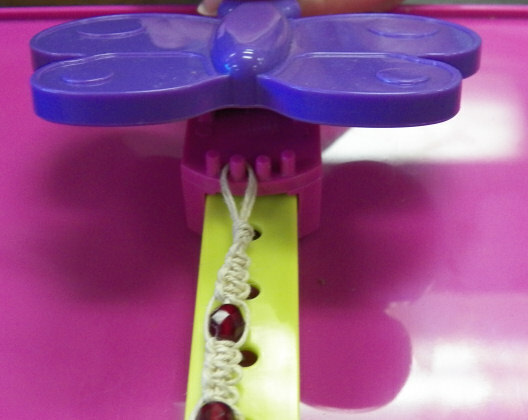 Check out lots of patterns on their Friendship Bracelet Maker's Facebook page. The Friendship Bracelet Makers are available at Michaels. There are other versions including a smaller Traveler version and a Clipboard version. A side note- My friend Teri has been considering getting one as a gift for a mutual friend. After seeing this one, she decided it was just perfect. My daughter is eager to teach the friend how to make friendship bracelets. Teri, who also tied a lot of bracelets back in the day agreed this was just brilliant. 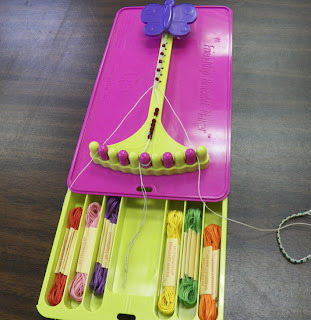 I received a complimentary My Friendship Bracelet Maker to review, my reviews are always my personal and honest opinion. You can read more about my review policy here. Hi Shala, I just so happened to stumble upon your site yesterday and boy am I glad I did! You are truly talented, creative, and so generous to share your work w/ us. I immediatly saved your site to my favorites bar and am positive I'll visit it several times a day. Thank you so much. Oh yeah, almst forgot I had a ? for ya..... The knot in this friendship bracelet looks great but I've never tried it before. Do you know the name of it or do you have a vid showing how to do it? I tried to do it according to your illustraions but it's just not working out for me. I've made a ton of paper beads and thought this would be a nice bracelet to use some on. Any help you can offer would be greatly appreciated. Again, Thank you for your wonderful site.